Home » SEO Blog » SEO News » Should Google+ be utilised for online brand awareness & SEO? After the success of many social other media sites, Google developed Google+ and after it’s initial release in 2011, despite a large marketing budget and advertising across its own platforms such as YouTube, it never really took off. That seems to have changed recently with many reporting that it could overtake Facebook as the most used social media site worldwide. Many were sceptical about Google+ at the beginning since it didn’t really offer anything new, many of the features simply replicating Facebook. Why has it become so popular lately? The rise in popularity of Google+ is perhaps due to the high amount of exposure created by Google, integrating the social media platform into other products and including it as a default app on android phones, often making users feel obliged to sign up. As Facebook heavily pushed onsite advertising in the last year, this could be one of the reasons people started to switch. Google+ is currently advert free. As the usage of Google+ continues to grow, we ask the question – should website owners promoting their brand online start using Google+? Although there is yet no clear evidence of Google+ directly influencing the ranking of a website on Google search, there are some clear benefits of being involved with Google plus. By setting up Authorship with Google+ you can get a profile picture of the author to show up in the search. As this highlights the search result (with the authors profile photo) you can experience a higher click through rate. It also adds an personal touch to a post making it look a bit more authentic and appealing. Information for branded Google+ profiles are increasingly being used on the search pages and the signs are that this will continue to grow as more people switch to Google+. 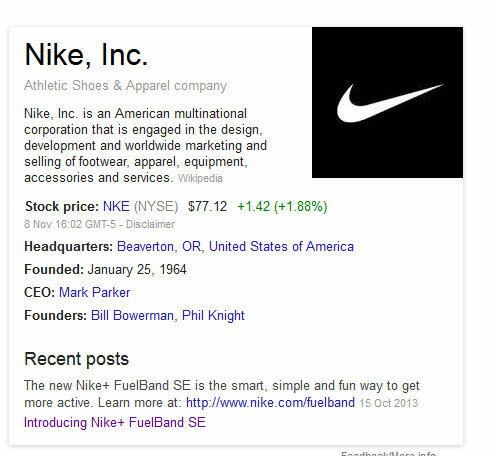 An example shows searches for Nike. The result also shows ‘Recent Posts’ which can be great for larger businesses promoting a particular event, product or feature. Recently Google introduced some new features whereby it shows links to posts shared by people in your Google+ circles directly on the search page. The most broad search terms can deliver a link to your blog when someone shares the link, perhaps an early sign on the effects of social media on the SERP. Recently Moz did a great whiteboard friday on how to take advantage of this new feature, and although you should note that this feature is time sensitive it can be a nice addition to your marketing. How effective will Google+ be in future? With an author rank algorithm patented by Google as ‘agent rank’ in 2005 combined with the growing success of their social media, you could start seeing a change in the influence on the search results as early as next year. Google+ gives the search another viewpoint on how useful the content of a website is directly from users and with Matt Cutts recently duming down the use of the PR tool bar could this be leading to social media being a bigger ranking factor? Links have always played a major part in ranking factors with the idea that if a piece of content is useful then people will link to it, the same could apply to sharing content and so it wouldn’t be surprising to see an algorithm based on a combination of the two in the not to distant future. Google will not be hasty in making the change to it’s algorithm and owning Google+ gives it an opportunity to test out possible algorithms and identify the effects before releasing them in a major update. It’s best to act now and start establishing some Google+ presence ahead of any possible updates.